One of the healthiest diets you can follow is the Mediterranean diet, in which fish and vegetables figure prominently. So if you decide to follow a pescatarian diet — a plant-based regimen that includes fish and seafood — you'll cut your risk of developing cardiovascular disease, cancer and cognition problems. However, if you do choose to incorporate more fish into your diet, be sure to choose varieties with minimal contamination from heavy metals. Fish and seafood have the advantage of being low calorie and protein rich with little to no saturated fat. These foods provide beneficial omega-3 fatty acids, which may help protect you from cardiovascular disease, high blood pressure, cancer and dementia. In addition, they’re high in iron and B vitamins. 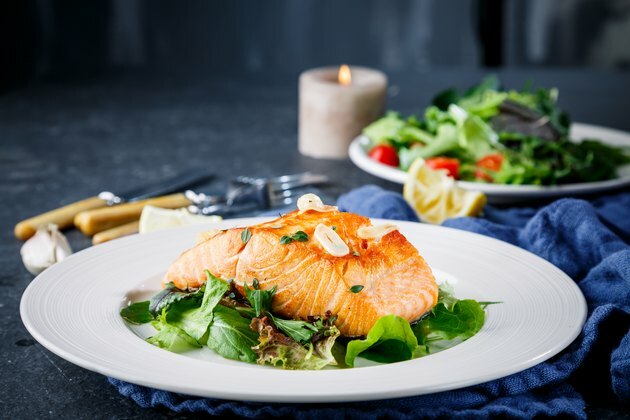 The Food and Drug Administration (FDA) and Environmental Protection Agency (EPA) recommends having fish two to three times a week in servings of about 4 ounces. The highest amounts of omega-3 fats occur in oily fish like anchovies, salmon, tuna and trout. Although nutrient dense, some fish come with a risk of contamination from heavy metals. Mercury, for example, is prevalent in some types of large, predatory fish and can affect brain development in infants and children and cognition in adults. Pregnant women and children in particular should avoid the most contaminated fish, which include shark, swordfish, king mackerel and tilefish. Safer fish and seafood choices include anchovies, Atlantic mackerel, catfish, cod, herring, mahi mahi, salmon, sardines, shrimp and trout. Boosting the vegetables in your diet is a win-win. Not only do vegetables contain fiber to improve your digestion, but they also supply vitamins, minerals and plant compounds that can help protect you from diseases such as heart disease, cancer, type 2 diabetes and kidney problems. Because they are low in calories, they may also help you lose or maintain your weight. You have a rainbow of choices when you add more vegetables to your diet — leafy greens, starchy vegetables, beans and legumes, red and orange vegetables, and others — with each supplying slightly different nutrients. The U.S. Department of Agriculture (USDA) recommends filling half of your plate with veggies to maximize nutrient intake and help calories low and your stomach full to make it easier for you to get to or maintain a healthy weight. You won't be bored on a fish and vegetables diet. If you can’t envision eating vegetables for breakfast, try a green smoothie made with soy or almond milk and leafy greens like kale or chard, or mix up a tofu scramble with peppers, mushrooms and onions. For lunch, opt for romaine lettuce topped with broiled or poached salmon or canned light tuna. Dinners offer you endless variety — broil any fish and serve with a sweet potato and mixed vegetables; create a stir fry using the veggies of your choice and shrimp or scallops; make burritos with black beans, peppers and onions; or order sushi from your favorite takeout restaurant.